ARCIMS is a remote minesweeping system developed by Atlas Elektronik UK. Image courtesy of The Royal Naval Minewarfare & Clearance Diving Officers' Association (MCDOA). A graphical image depicting the rear of the ARCIMS. Image courtesy of The Royal Naval Minewarfare & Clearance Diving Officers' Association (MCDOA). The ARCIMS has an average towing speed of 8k. Image courtesy of Ministère de la Défense. ATLAS Remote Combined Influence Minesweeping System (ARCIMS) is manufactured by Atlas Elektronik UK. Based on an unmanned surface vessel (USV) platform, the ARCIMS is intended to offer next-generation mine countermeasures (MCM) capability to the naval forces. The ARCIMS with ‘in-theatre’ proven technology is an ideal platform for multi-influence minesweeping missions. It offers remote mine hunting and disposal payloads in a flexible and cost-efficient package to counter a range of mine threats. The ARCIMS platform was unveiled at the Defence Security and Equipment International (DSEI) exhibition in September 2013. The system underwent extensive trials at Bincleaves sea test facility before achieving operational efficiency. It was recently displayed during Defence and Security Equipment International exhibition (DSEI 2015) in September 2015. The ARCIMS was preferred by the UK Ministry of Defence (MoD) for the Mine Countermeasures and Hydrographic Capability (MHC) Sweep Capability project of the Royal Navy (RN), in March 2015. 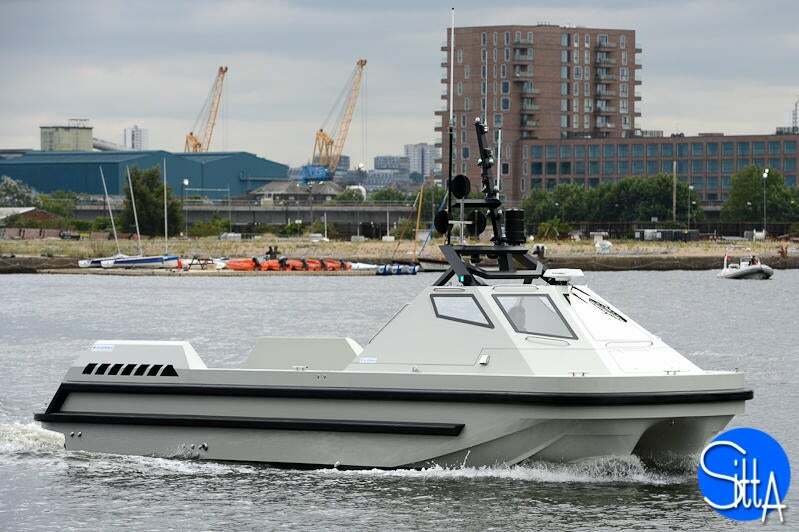 Hazard, a manned version of the ARCIMS, is in service with the Maritime Autonomous System Trials Team (MASTT) of the Royal Navy. Atlas Elektronik delivered two ARCIMS to an undisclosed customer based in the Middle East. The ARCIMS platform is mounted on a glass-reinforced plastic (GRP) tunnel hull craft made by ICE Marine. It was designed to allow easy and rapid transport by land, sea or air to offer quick response to asymmetric threats. The shock-resistant platform offers high-manoeuvrability and towing capability during missions. The highly mobile ARCIMS can be easily integrated with MCM platforms, surface vessels or shore-based command and control systems. The deployment of a single or multiple ARCIMS increases the pace of MCM missions. The USV is also certified for manned missions. The system can be controlled from the ground or surface vessels and can be easily adaptable for new roles. The ARCIMS can be operated independently or combined with an integrated mine warfare system. The ARCIMS autonomously performs mission planning, execution and analysis, with command and control by the operator. The high levels of automation reduce operator workload. The system avoids human exposure to minefields by employing approved safety systems in mine clearance operations. The unmanned platform measures 11m-long, 3.2m-wide and 0.5m-deep. It has a weight of 6,000kg and can carry a maximum payload of 3,000kg. The system requires minimal maintenance and training and is also offered with integrated logistics support (ILS) from the company. The modular payloads aboard the vessel offer an effective capability against all types of mines and allow the vessel to perform minesweeping, hunting and disposal missions. "It offers remote mine hunting and disposal payloads in a flexible and cost-efficient package." The versatile and spacious mission bay accommodates ATLAS minesweeping payloads, including a power generation module (PGM), and towed magnetic, acoustic and electric sweeps. The mission bay can be integrated with Northrop Grumman AQS-24 mine-hunting system, which can be launched and recovered from the stern. The AQS-24 features a high-resolution, side-scan sonar and a laser line scanner. The ARCIMS USV is powered by two engines driving two water jets or propellers. The propulsion system ensures a maximum speed of more than 40k and an average towing speed of 8k. SAES - S.A. Electrónica Submarina specialises in undersea security and defence, providing some of the most advanced multi-influence naval mines on the market. SAES simulators allow individual specific training or simulation of joint missions among various navies. It is possible to recreate any situation or scenario. SAES also develops interface simulators and functional simulators of equipment and systems to be used in the development, integration and validation of projects before all the equipment required for them is available. SIDIS is a high-performance multi-sensor system directed to detect, track and classify underwater intruders in maritime areas to be protected. SIDIS provides additional capabilities of reaction and deterrence against threats.